There are some phenomenal facts and figures about the science of microbiology, which is the branch of science that deals with micro-organisms including bacteria, viruses, and fungi. Perhaps the most remarkable statistic is that you are born 100% human, but you are now at least 90% bacterial and only 10% human. That is because only 10% of the cells in and on your body are your own (around 1016) whereas 90% of the cells in and on your body are bacterial (around 1017). We often think of bacteria in the context of infectious diseases, but the natural state of almost all bacteria and other microbes is ‘symbiosis’, a mutually beneficial arrangement. The science of microbiology dates back to the late 17th Century, when a scientist called Antonie van Leeuwenhoek created a remarkably sensitive microscope, and viewed bacteria, which he called ‘animalcules’ (“little animals”). Around 200 years later Louis Pasteur and others established the modern science of microbiology, along with ‘Germ Theory’. The main point being that there was no understanding of this microscopic world thousands of years earlier when the Bible was written. Nonetheless, we can see the work of microbes throughout the Bible in, for example foodstuffs (bread, cheese, and beer), and diseases (boils and botches, plagues, dysentery etc. – 2 Kings 20:6, Lev 26:16, Num 14:37, Acts 28:2-8). I am a microbiologist by trade, so find all of this fascinating; I hope you do too! An intesesting question is when did disease-causing microbes come on the scene? The picture that we are given of the Garden of Eden is harmony (or symbiosis) before the first sin (Gen 2:9), and broken harmony after it (Gen 3:18-19). The fall also introduced human death into the equation: something must have changed genetically to allow this – perhaps the introduction of mutations to DNA during cell division, which seems to be at the root of human aging. Or perhaps the change was environmental (less protection from the sun’s harmful UV). Either way, it seems plausible that whatever caused humans to begin to get old and die also had an impact on the microbial world. If DNA mutations were introduced (or accelerated greatly) after the fall, then this could explain the emergence of microbial pathogens. After all, most human infectious disease is caused by bacterial dysbiosis, where the natural balance of things is disrupted and bacteria take over. When Israel was a slave nation in Egypt, it took a series of plagues on Egypt for the Pharaoh to let them go. These plagues are presented without any link between them, but there is a plausible sequence of events related to the microbial world which is worth exploring. Now, this may be a challenging idea for some readers, who may accuse me of “explaining away” a miracle from God. But I don’t think speculating on a natural explanation for a miracle should detract from its ‘miraculousness’ – in fact, God tells us exactly how he allowed the Israelites to cross the Red Sea – with a wind (Ex 14:21; a miraculous manipulation of natural processes). 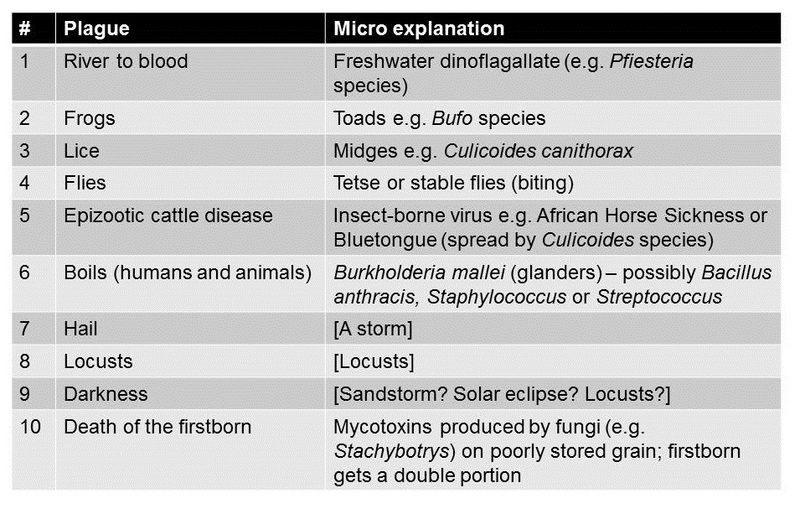 Now, back to the plagues: the potential biological explanation and link between the plagues is summarised in the Table below. An excellent post on Rectofossal.com goes into a good amount of detail on the sequence summarised in the table (you may not agree with the style of this blog, or its conclusion, but the detail is there)! In short, a dinoflagallate bloom could have turned the River Nile red (plague #1), driven the toads away to look for food (#2), created an infestation of midges and flies when the toads began to decay (#3 and #4), an outbreak of an epizootic viral disease affecting only cattle (#5), followed by an epidemic bacterial disease affecting both animals and humans (#6). Then there was a storm, a plague of locusts, and unexpected darkness – an eclipse perhaps (not a great deal of microbiology here) (#7, 8 and 9). And finally the death of the firstborn. It is easier to say that this last plague was an outright miracle with no biological explanation. 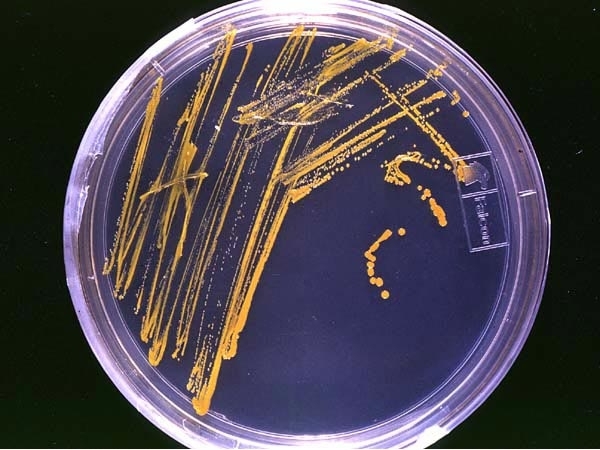 Although, it is interesting to speculate that this may have been as a result of mycotoxins produced by fungi (e.g. Stachybotrys species) on grain stored hurriedly and badly to get it away from the storm and locusts; the firstborn of each family would get a double portion at the meal table, and therefore tip over into the lethal dose of the mycotoxins! Perhaps the most compelling area where I see microbes loud and clear in the Bible is in the public health value of the Law of Moses. Remember, when the Law was issued around 4000 years ago, about 3800 years before ‘Germ Theory’ was formalised. And yet, the Law is built around the infection control and public health principles that we continue to stand by today! It's worth being clear at this early stage that the Law of Moses was not a public health manual – but a religious and moral code with incidental (but significant) public health value. Therefore, we shouldn’t be surprised to see a lot in the Law that has no relevance to public health – but I would be alarmed to see any practices recommended that are directly opposed to public health principles! A good example is how ‘ceremonial uncleanness’ was used. When a woman gave birth, she became ceremonially unclean for a period (Lev 12:2). Whilst this sounds awful, it meant that she was segregated from others and had to wash more than usual. Giving birth was a very dangerous business not very far back in history. In the mid-1800s in Austria, Ignaz Semmelweis noticed that doctors were examining bodies in the mortuary and then going to deliver new babies. When he introduced a simple hand washing step, the maternal mortality rate plummeted from around 15% to less than 5%. In this sense, the Law of Moses was ahead of its time, protecting the new mothers, and allowing the nation to populate more rapidly than their neighbours. Equally, if somebody came into contact with a dead body, they would become ceremonially unclean (Num 19:11). If that person had died from an infectious disease, then the risk of spreading it would have been considerably lower with this law in place. Sadly, we saw in the fairly recent Ebola outbreak in Africa that one of the key transmission methods was through extensive ceremonial contact with dead bodies. Again, the Law of Moses was ahead of its time. Sanitation – principally the management of human waste – is a relatively modern invention. Images of the open sewers in Victorian London illustrate how far we have come in terms of sanitation in a relatively short space of time. The Israelites didn’t have the facility for underwater sewage works due to their nomadic existence, so the simple rule was to do your business in a hole dug outside the camp and covered up afterwards (Deut 23:12-13). This simple rule would have prevented the spread of countless gastrointestinal diseases! The Law of Moses also provides some rules that would have improved food hygiene. The Law of Moses separated animals into ‘clean’ (which could be eaten) and ‘unclean’ (which could not be eaten). Clean animals included most cattle and some birds, and fish with fins, whereas unclean animals included certain meats e.g. pork, carrion-feeding birds, and filter-feeding fish and most “seafood”. As you can see, the clean foods were inherently safer from a food hygiene viewpoint. Also, since there was no refrigeration in the desert, the Law of Moses provided a “sell-by” date for foods (Lev19:5-7). I am sure the Israelites had no idea why some foods were classified as clean and others as unclean, but the distinction certainly makes sense from a food hygiene viewpoint! We have posted before about where science meets religion, and that trying to view the Bible as a scientific document isn’t that useful. However, for an ‘unseen science’ like microbiology, there’s plenty of ‘unseen reference’ to microbes throughout the Bible. In my view, microbes had to be there from the very beginning of life – and it seems plausible to me that disease-causing microbes only came into existence after the Fall. I am pretty sure there was some interesting microbiology going on behind the plagues on Egypt, which most likely provided some of the mechanisms that God used. Finally, the Law of Moses was ahead of its time from an infection control and public health viewpoint. I’d be fascinated to hear your feedback on this post!